VAN WERT — It tells you a lot when your pitching ace doesn’t have his best stuff but still strikes out 15 batters and you win the game 10-1. That was the case with Van Wert against St. Mary’s Friday night as senior Lawson Blackmore threw a whopping 126 pitches (75 strikes) in the Cougars’ win. Van Wert is now 10-2 overall and 3-1 in the WBL. St. Mary’s is 3-7 and 2-2. Pitchers are allowed a maximum of 125 pitches in a game, but are allowed to finish the hitter after the 125th pitch is thrown, which is what happened with Blackmore in this one. The 6’5 senior had to rely primarily on his fastball because the curveballs were drifting high above the strike zone. “He (Blackmore) threw a lot of pitches today,” said Van Wert coach Charlie Witten. “Seemed like he got behind a lot of guys, but obviously his stuff is that good that he can miss and still be effective. I know he had a lot of strikeouts, but I wouldn’t consider it a great day on the mound for him. He wasn’t locating tremendously.” Blackmore walked three. Meanwhile, the Cougar bats were alive with 13 hits spread among nine different batters. Van Wert took a 2-0 lead in the bottom of the first via three singles — second baseman Nate Lautzenheiser, catcher Hayden Maples, and first baseman Nathan Temple (RBI) — and an opposite field sacrifice fly by Blackmore. If that 2-0 lead wasn’t reassuring enough for Van Wert fans, the Cougs made pretty certain of things with three more, all unearned, in the fourth. The home team had four singles — Temple, Blackmore, centerfielder Jalen McCracken, and shortstop Jaxson Amweg — in that inning, and the Roughriders chipped in with two throwing errors — 5-0, Van Wert, after four. The Cougars added one in the fifth and four in the sixth. All ten runs were charged to Memorial starter Blake Kanorr, although only six of them were earned. Kanorr threw strikes — 60 out of 92 pitches, and he walked nobody, but Cougar batters seemed to find the holes. 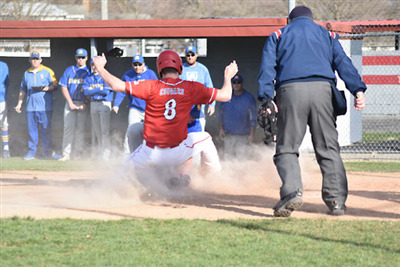 Only one of Van Wert’s 13 hits — a long double to center by third baseman Parker Conrad in the fifth — went for extra bases. Van Wert hitters were led by Temple (3 for 4, three runs, two RBI), Amweg (2 for 4, one run), and Lautzenheiser (2 for 4, one run). St. Mary’s had only four hits, all singles, two of them coming off the bat of catcher Trey Fisher. The Riders did put two hits together — leftfielder Wyatt Bailey and third baseman Clay Quellhorst — in the fifth to produce a run. Carson Fischbach cf 2-0-0-0, Braeden Trogdlon cf/p 2-0-0-0, Henry Spencer 1b 3-0-0-0, Dylan Trogdlon rf/cf 3-0-0-0, Trey Fisher c 3-0-2-0, Wyatt Bailey lf 3-1-1-0, Riley Sweigart dh 3-0-0-0, Clay Quellhorst 3b 2-0-1-1, Blake Kanorr p 1-0-0-0, Carson Liming rf 1-0-0-0, Ethan Rose ss 2-0-0-0, Ethan Freewalt ph 0-0-0-0, Derek Fisher 2b 0-0-0-0. Totals 25-1-4-1. Jaxson Amweg ss 4-1-2-0, Jake Lautzenheiser 2b 4-1-2-0, Hayden Maples c 4-2-1-1, Nathan Temple 1b 4-3-3-2, Lawson Blackmore p 3-1-1-1, Parker Conrad 3b 2-0-1-1, Owen Treece 3b 0-0-0-1, TJ Reynolds lf 3-1-1-0, Mason McHugh lf 1-0-1-1, Keaton Brown rf 3-0-0-0, Turner Witten ph 1-0-0-0, Jalen McCracken cf 3-1-1-0, Taylor Zeeff ph 1-0-0-0. Totals 33-10-13-7. Errors: Bailey, Kanorr, Trey Fisher 2. SB: Trey Fisher. Sac Fly: Blackmore. Sac Bunt: Conrad. Double: Conrad. Pitches/Strikes: Kanorr 92/60, Braeden Trogdlon 27/17, Blackmore 126/75.